Umbria is a region in Italy located between Rome and Florence, just south of Tuscany. It is filled with mountainous hills which rise up over 1,000 meters. Many of the hilltops have towns and villages on them which date from pre-Roman times. The hilltop towns provided very strong defense while allowing the residents to down into the valleys during the day to tend their fields. The Romans conquered all of the area and made these towns bigger and stronger, building temples to their gods and adding many public buildings. In the Middle Ages during the era of cathedral building, the last remnants of Roman ruins were cleared away and many beautiful churches and cathedrals were built in these towns. The Renaissance brought even further enhancement. There are probably over 50 of these hilltop towns dotting the Umbrian countryside and they are very cool. One of the prettiest is Todi, just off the A45 expressway between Terni and Perugia. 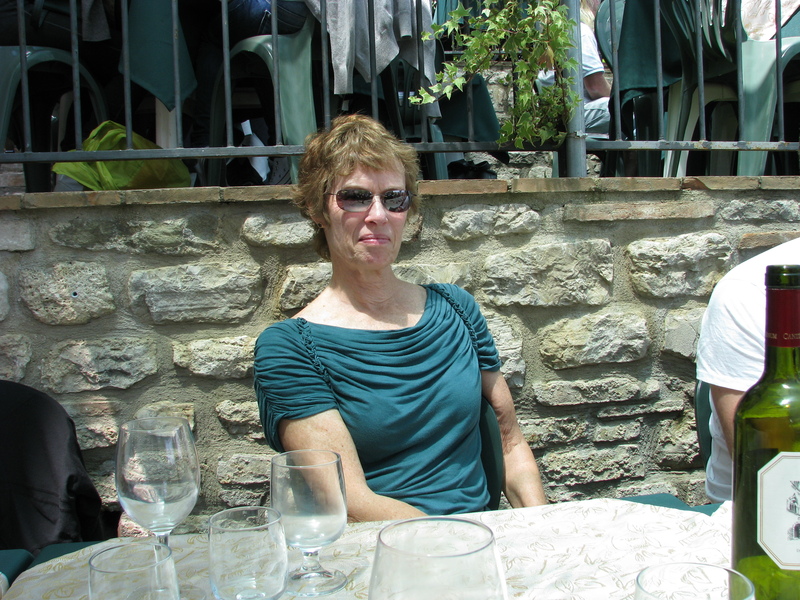 We were with a group of friends and we were looking two things – the famous Umbrian thin crust pizza and a setting which would allow us to appreciate the wonderful scenery. 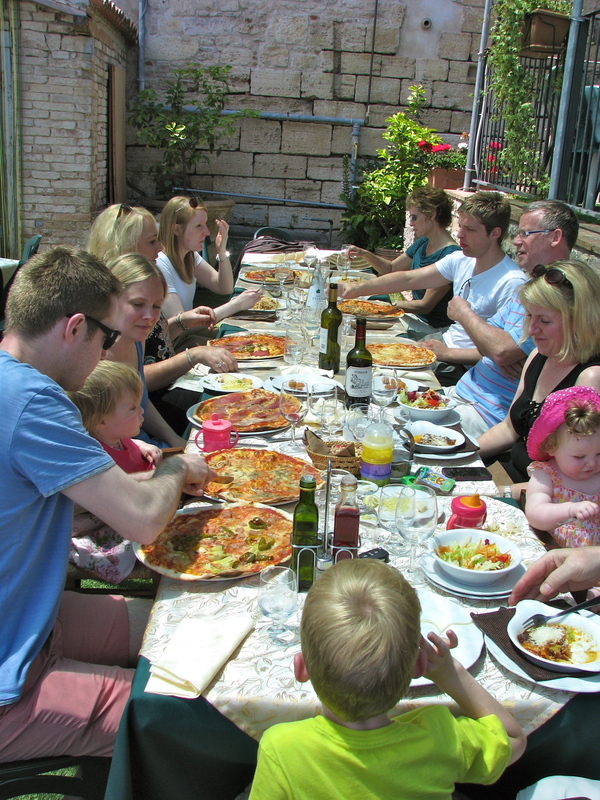 Ristorante Pizzeria Cavour filled the bill. We had heard about this spot from other friends. 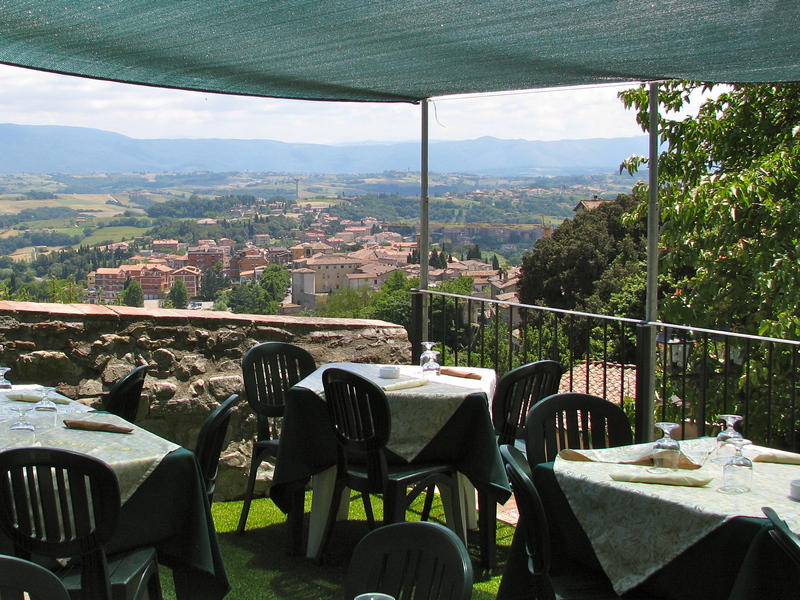 Although the street entrance is humble and unimposing, the outdoor terraces on the back of the restaurant literally hang over the edge of the hilltop and look far into the valley. 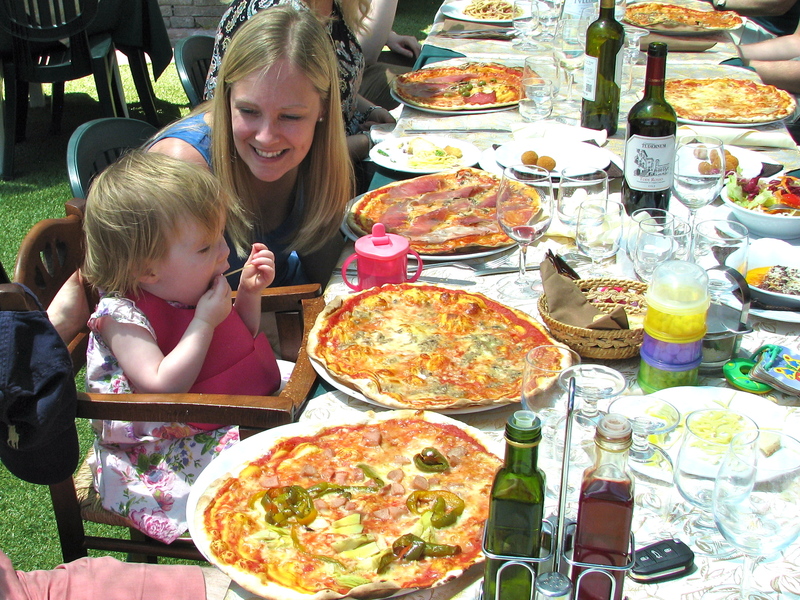 More importantly, the pizzas were wonderful as you should be able to appreciate from the photos. 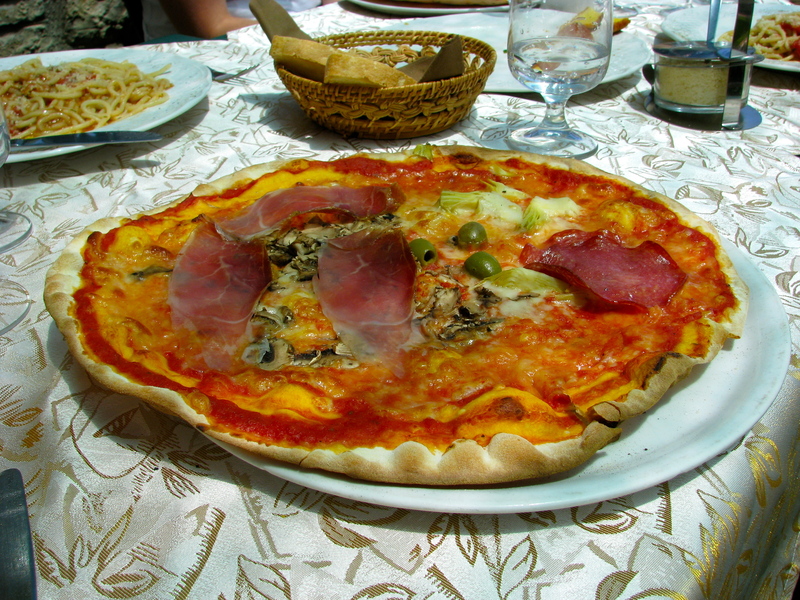 My favorite pizza is the Cuattro Stagione. This restaurant did a great job. Artichoke, olives and two types of ham. 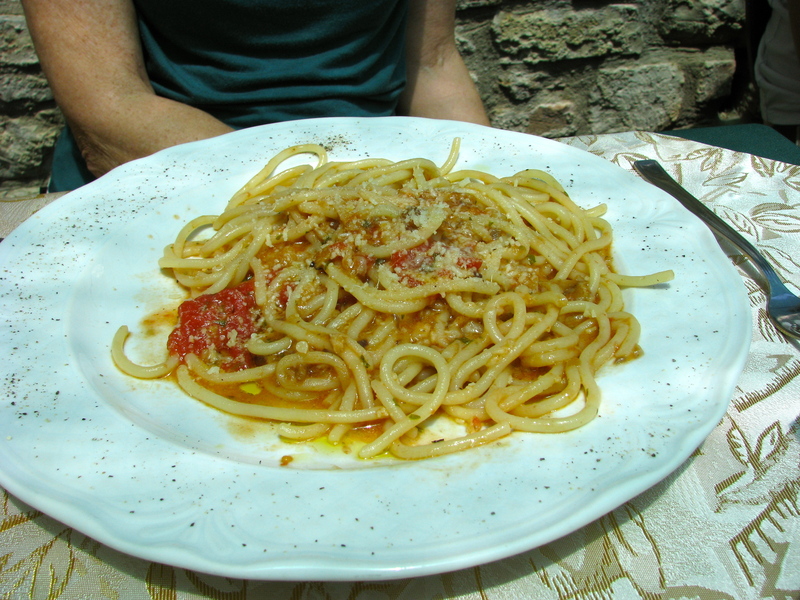 Umbria is also famous for a special pasta called stringozzi, a fat spaghetti noodle that has a chewy character. It is often served with a truffle sauce. Needless to say, some of our group had to try that. A true Bravado chef would only travel in Italy with a beautiful woman. It just seems so right. No wonder you are working out now!